Community Blog by Sapato64 // What if Rambo was made into Assassin's Creed? Isn't it the perfect game? What if Rambo was made into Assassin's Creed? Isn't it the perfect game? You know what franchise blueprint would make the perfect Rambo game? Assassin's Creed, and I made this video to prove it. Come on make it happen! Hey everyone, allow me to introduce myself. My name is Sapato and I’ve been gaming since as long as I can remember. My first console I started on was the Atari 2600, and it was my brothers. Years later, we received the Nintendo Entertainment System from our mom. I still remember the day and giving her a great big hug. The NES changed everything, no longer were we controlling squares and hearing blips and bloops. ( I was too young to understand it anyways) Instead characters came to life and all kinds of catchy melodies came out from our television. Our Nintendo came with R.O.B. the robot which was kind of useless, since he was so slow to move, It was supposed to function with the included Gyromite. It was probably the first form of Co-op gaming we had. Thankfully Super Mario Bros and Duck Hunt also came with the system. So we had an NES, followed by a Master System, Genesis, SNES, 32x, Sega CD, and so on and so on. Shout out to J&J Video Games for making trading-in Video Games possible. It was a store at the local flea market plaza. If it wasn’t for them I would not have played as many games as I did. 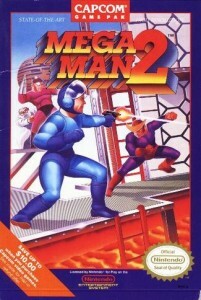 Mega Man 2 to this day still stands as my favorite game. The variety of bosses, the music and power ups, and the level design were all top notch. I played it so much that I was able to beat it with just one life. Not really a hard achievement considering the USA’s normal mode was actually Japan’s easy mode, and difficult was Japan’s normal. So there you have it, I hope to post often on the current games I’m playing and making this a gaming journal even if no one else reads it. Thank You for your time, and I hope you enjoy the site.